The Wine : This French varietal has a distinctive combination of fruit and spice in the aroma, making for a lively wine. This medium-bodied red boasts flavours of red fruit with hints of anise and tobacco. Fine tannins leave the palate balanced on the finish. The Region : The Rhone Valley begins in the Alps and continues for more than 500 miles along the Rhone River ending at the Mediterranean Sea. Southern Rhone has a Mediterranean climate with warm summers, mild winters and less rainfall than its northern counterpart. Vineyards line both sides of the river and the Mistral wind from the north blows away moisture, brings beautiful sunshine, and cools the landscape in the summers, which is perfect for ripening grapes. Food : Grenache is a brilliant wine to match with many types of cuisine. Try with grilled, stewed and braised game meats as well as hearty stews. A roasted lamb shoulder with rosemary would be a wonderful pairing. 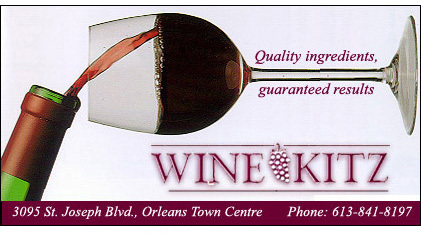 The Passport Series wines are available exclusively at the Orléans Town Centre Wine Kitz location on St. Joseph Blvd. near the corner of Prestone Drive. You can reserve your kit now by calling 613-841-8197 or e-mailing winekitzorleans@bellnet.ca. Mention that you read about this wine in Grape Pickings and receive a $10 discount.